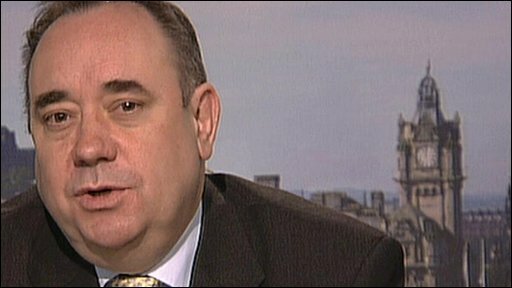 Alex Salmond: "We've been incredibly reasonable about this"
The Scottish National Party (SNP) aims to raise £50,000 to proceed with legal action over the prime ministerial debate on BBC 1 on Thursday. The party said it was not trying to stop the broadcast but it wanted an SNP politician included "for balance". Plaid Cymru said it supported the SNP's stance but would not take part in joint action due to separate legal systems. Scottish Labour described the SNP's move as "desperate action from a party desperate to appear relevant". The SNP said it had started a "fighting fund" to raise the money over a 48-hour period, stating shortly before 1800 BST on Sunday it had managed to raise £26,000. If the appeal is a success, the party intends to lodge papers at the Court of Session in Edinburgh on Tuesday morning. The SNP said its proposed action would seek to ensure that the debate was broadcast in Scotland "with the nation's political make-up fairly reflected". This would involve either having SNP representation in Thursday's debate or through an agreement to have a further" fair leaders' debate" organised before polling day. SNP leader Alex Salmond said: "The decision by the BBC, who are meant to be Scotland's national broadcaster, paid for by our licence fees, not to have the country's political make-up properly represented next Thursday is a democratic disgrace. "Everyone knows it is a stitch-up demanded by the London-based parties and meekly agreed to by the BBC. "That's why the SNP are today launching a fighting fund to raise the money needed to challenge the BBC's decision in court." Mr Salmond said the cash needed for the action was "a huge sum" for his party but he felt the issue was "too important to ignore". Labour candidate for Inverclyde, David Cairns, said the SNP's hopes of challenging the debate format was an act of desperation. "There have already been two Scottish debates, televised across Scotland, on Scottish issues that involve the four main parties in Scotland and there will be another to come before polling day," he said. "These prime ministerial debates are not here to feed Alex Salmond's vanity, they are to help people make an important decision about who should lead this country." Last week, the BBC Trust did not uphold a complaint from the SNP and Plaid Cymru over their exclusion from the debate. Mr Salmond, Scottish Secretary Jim Murphy, shadow Scottish secretary David Mundell and Liberal Democrat Scottish spokesman Alistair Carmichael have taken part in a debate on Sky News. The 90-minute programme saw each politician respond to individual questions and take part in a session of open debate.